Mobile Chaos: What will be your next wearable tech device? I personally have used the Nike Fuel band for about a year now. I chose this one over the others mainly because of the fact that I can use it as a watch. As many may know, I'm in the Army and I can't wear bracelets while in uniform. The Fitbit and Jawbone devices can be described as bracelets (the Jawbone the more attractive to the two) since they don't have displays that show more than dots or basic LED pictures. The Fuel band works two fold for me. It looks sort of like the rubber live strong bracelets but has the functionality of tracking the time, calories burned, steps and Nike Fuel. Nike Fuel is a metric made up by Nike to track movement. 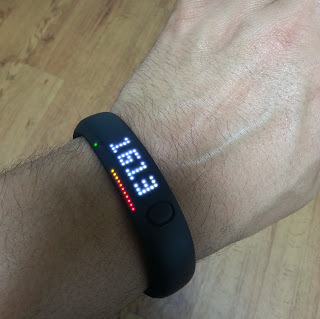 The Nike Fuel Band has an accelerometer to track movement but there are no defined rules for how it reports data. Basically what I'm saying is that you can fool the device to think you are being active by simply moving your wrist in circles. Is this real exercise? Probably not but in reality it is movement. So if you are within a few hundred fuel points of your goal when you prepare for bed, do some jumping jacks, pushups or simply move your wrist in circles to get to your goal. It is cheating? Probably so but it is movement and that's what it tracks. As mentioned above, the fuel band tracks movement and you can set it up by plugging it into your computer via USB and set up a few basic statistics about yourself. You can enter your age, height, and weight and then set goals that you hope to meet daily. The average active person has a goal of 3,000 points while a highly active person has a preset goal of 5,000. You can change these goals to suit how you live your live. If you are mainly an office worker, your goal might be between 2,000 and 3,000 fuel points. If you routinely workout before work and maybe coach a sport after work, you might be able to reach a goal of 5,000 point easily. The goals are left up to you to set. If you don't achieve your goal after a week or so of use, plug it into your computer and adjust your goals. The whole goal of the Nike Fuel Band is so you can look at your band mid-day and realize that you haven't been as active as you wanted so you maybe take the stairs instead of the elevator or maybe get off the bus a stop early and walk the extra distance home at night. I've never had my band run out of battery life for the year that I've had it. I routinely charge it every 4-5 days and it syncs while charging. I have had warnings telling me that the device was running out of memory but all that takes is syncing the band with a computer via USB or iOS device via Bluetooth. Both methods will sync your data with the Nike Plus website and allow your device to keep working. So what will be your choice in wearable tech in the coming future? My choice is still the Nike Fuel Band which has a rumored 2.0 version that will support Android and Bluetooth 4.0 technology coming in the future. Why do I choose this one? I pick the Nike Fuel Band simply because it has a watch interface that the rest do not. Because it has a watch, I can wear it while in uniform. While others may look better or even perform better, I choose the Nike Fuel band because I can use it as a watch. Let me know in the comments or on Facebook if you are already using a wearable tech device or if you plan on using one in the near future. If you want to add me on the Nike+ website, my user name is ojdurham1.